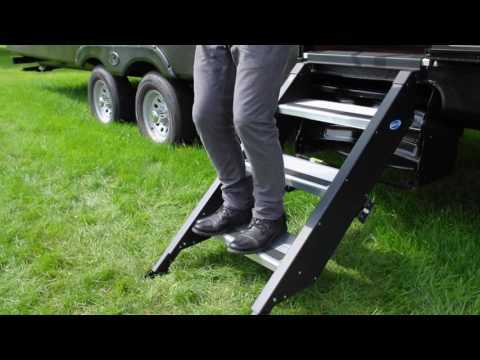 MORryde has developed the next generation of RV steps. No more bouncing, no more instability, no more wobbling. The StepAbove® by MORryde is the sure fix to all of these issues. MORryde's SRE4000 suspension system levels the playing field when towing a trailer or fifth-wheel and extends the lifespan of components. No one likes to be jerked around. Eliminate your fifth wheel's back and forth chucking with MORryde's rubber pin box. Instead of moving up and down, MORryde's pin box moves back-and-forth and side-to-side to absorb that transfer of energy from the trailer to the truck. Simple. Safe. Secure. The Chair Buddy™ eliminates the need for bulky, awkward straps and bungee cords to secure dinette chairs. Simply mount it to the center post then pull the bar down to hold the chairs in place. MORryde has been an innovator in the vehicle suspension systems, delivering solutions for a variety of applications, budgets and industries. No matter how often things change, one thing stays constant - our commitment to delivering a suspension system you can trust. We are not just limited to enhancing your RV travel experience. MORryde has recently added several metal fabricated Jeep accessories from Jerry Can Holders to Heavy-Duty Hinges to extend your adventure. The Drop Down Wall Mount moves out form the wall and drops down for a better viewing angle. The ability to drop your TV mount down allows you to reduce the glare that is all too common. Easily access the outdoors from your patio with the durable MORryde Steps. The collapsible handle that stays attached makes these steps easy to store when not in use. Space is precious in your RV. Maximize your storage and take advantage of every inch with the Hidden Storage Tray. It is installed in the recess of the storage compartment and slides down and out to access contents. The name says it all. Free up storage space with the Easy Reel, which neatly stores 30- and 50-amp power cords. This space-saving product joins a whole host of MORryde innovations that bring more livability to the RVing experience. Tilt, swivel, flip or slide, MORryde offers a versatile lineup of TV mounts. Known for rugged quality and sleek functionality, these TV mounts are durably suited for recreational vehicles, hospitality suites, home applications and more. Slidezilla, MORryde's patented Elevated Tray storage system doubles your truck bed. Positioned about the wheel wells, creating an easy-to-use bunk-storage system for work or play. And now, MORryde offers an in-bed slide to more than double your storage options. At MORryde, we have a passion for solving problems. Whether we’re fabricating custom solutions, modifying a commercial chassis or engineering innovative products, we answer to a wide range of markets and provide solutions for variety of needs. At MORryde, it’s simply about doing MORE for our customers, and it doesn’t stop at the sale. We stand behind our products, believing in quality first, service always. No matter the issue, we’ll be the first to respond and the last to be satisfied.